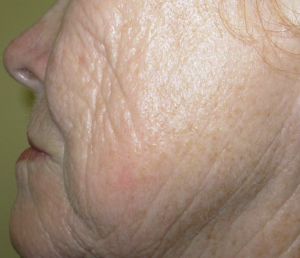 CO2RE Carbon Dioxide Fractional Laser Resurfacing (also known as Fractionated CO2 Laser) uses light energy to remove layers of skin in a columned pattern, leaving an intact cushion of skin surrounding each damaged portion, to speed up healing. This is a fairly aggressive and highly effective treatment for deep imperfections, such as scars and wrinkles, or environmental damage to your chest and hands. The laser essentially vaporizes damaged skin, so that your body can get busy healing the tiny wounds by making fresh, new skin. While the old skin may have had uneven pigmentation or scarring, the new skin will be tight and smooth. CO2RE is different from most fractional laser systems, because it uses two types of beams to penetrate different depths of skin at the same time. This means it can treat a variety of issues, in some cases, in a single treatment. Because of this dual-beam system, CO2RE is an excellent option to simultaneously treat lines and age spots. It’s mostly used on the face, but it could also treat the neck, chest, and hands. Our Fractionated CO2 Laser services are available at our Winter Park and New Smyrna Beach locations. 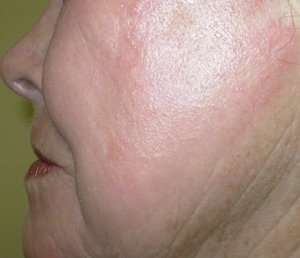 The Fractionated CO2 Laser is best for patients with light skin who have deep scars or extensive sun damage, signs of aging, and irregular pigmentation. If you have mild pigmentation issues and scarring or fine lines, this treatment may be too intense. Check out our other laser treatments, elōs Plus or Vbeam Perfecta, which may be just right. If you have darker skin, schedule a consultation prior to treatment, because lasers carry a risk of hyperpigmentation. (A series of very gentle CO2RE treatments or a series of chemical peels may be your safest option, but our doctors can help you make the best decision.) It’s not recommended for tattooed skin, pregnant women, deeply tanned patients, or patients who have taken Accutane or another isotretinoin in the past six months. If you have a history of cold sores or herpes, let your doctor know, because this may influence your healing process. It’s a good idea to stop applying harsh exfoliants or acne treatments two days prior to treatment. Depending on the size and location of your treatment area, you may be given a sedative or pain med that makes you drowsy. Check with your doctor ahead of time to see if it’s okay to drive yourself to and from treatment. You’ll receive a topical anesthetic, and then a “wand” is smoothed over the treatment area. This wand delivers the lasers to your epidermis and dermis, in a process that may take up to an hour. You’ll feel and look sunburned for a day or two, and you’ll need a week to fully recover. You should avoid makeup and skin care products for about a week. Depending on the treatment area and your personal goals, one treatment may be enough. Other cases require a few treatments. You’ll see a significant evening of skin tone and a reduction in lines and wrinkles. If you keep the treatment area moisturized and protected from the sun, you should continue to see improvement for up to nine months following treatment. These results are semi-permanent to permanent, which means you may never need another treatment, or you may need a maintenance treatment in a year or a few years.